Hotel Tilto is an Irish owned boutique style hotel situated in the heart of the city of Vilnius, Lithuania. The hotels is located in a 200 year old building, full of history. 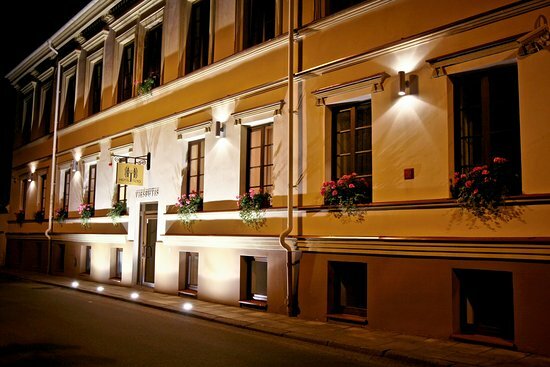 The hotel offer guests a warm homelike stay within the old town of Vilnius. Standard Room: 10 standard double rooms and 8 standard single rooms. These rooms are on the 1st and 2nd floor only. Guinness Bar: After a long day of sight-seeing, spend some quiet time in our cellar bar. The cellar restaurant serves breakfast daily. Hotel Tilto is located on Tilto Street in Vilnius. A quite street running parallel to the city’s premiere high-street Gedimino Avenue. 240 metres from the main Cathedral Square, you can discover all the sights at your own pace and enjoy the charm of Vilnius UNESCO protected old town.